Home › Tufted duck › Greater scaup - Aythya marila. The greater scaup (Aythya marila) is a medium sized diving duck belonging to the family Anatidae. The greater scaup species is distributed in Asia, Europe, United States and Canada. It is a rare visitor to the Indian Subcontinent. Aythya marila was previously included in the genus Anas. These scaup species are considered closely related to A. affinis. The two recognized subspecies are: A. m. marila (Linnaeus, 1761) and A. m. nearctica Stejneger, 1885. The greater scaup is a medium sized bird and the male scaup is slightly larger than the female. The male measures 40 to 50 cm in length and weighs 850 to 1,400 grams. The female weighs 700 to 1,300 grams. The wingspan is 70 to 80 cm. The male bird has a bluish bill and pale yellow eyes. 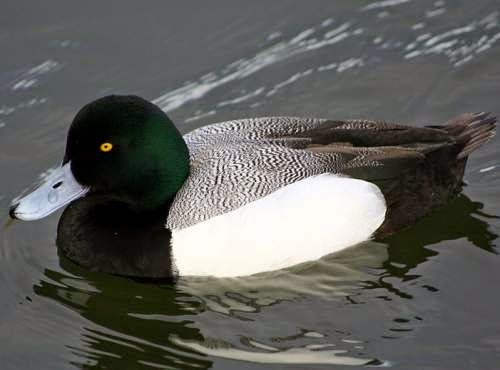 The head of male greater scaup is rounded and black with a dark green sheen. The belly and flanks are bright white. The breast and tail are black. The back is lighter and patterned. The female had a brown head and body. The breeding scaup inhabit shallow, freshwater lakes, pools and rivers with grassy shorelines. The wintering birds are observed on shallow coastal waters, sheltered bays, brackish lagoons, estuaries, inland lakes and reservoirs. The greater scaup species are omnivorous and feed on aquatic plants, seeds, leaves, weeds, crustaceans, aquatic insects, molluscs and other invertebrates. The breeding season is during May and June. The scaup are monogamous. The nest is built on the ground hidden in vegetation. The female lays six to nine olive-buff-colored eggs and incubates them. The subspecies A. m. marila occurs in North Europe, Iceland and Siberia. They winter in Northwest Europe Black and Caspian Seas. The subspecies A. m. nearctica occurs in Siberia, Bering Sea coast, Alaska and Canada. They winter in Pacific coast of Asia, China, and on both coasts of North America. The greater scaup species are highly migratory, breeding near arctic regions and migrating to warmer south from August onwards. The return spring migration generally begins in February. The global population of greater scaup species is estimated to be 1,200,000 to 1,400,000 individual birds. These scaup species have large range and population and have minimal conservation concern. Legal hunting, habitat loss and fishing activities are the major threats in conservation. These species are susceptible to avian influenza. The IUCN (International Union for Conservation of Nature) has categorized and evaluated these scaup species and has listed them as of "Least Concern". Current topic in Birds of India: Greater scaup - Aythya marila.